Did you know that Sidekick City and Riverdale share the same downtown area? Did you know they also share the same school buses, playgrounds and dry cleaners? Well, the Tiny Titans and Little Archie's gang didn't know, either! What would happen if suddenly their two worlds collided? 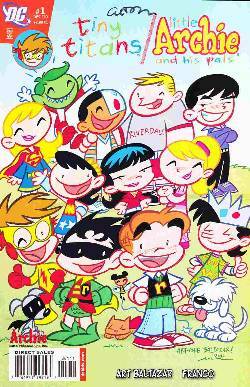 Would Archie and his pals start wearing costumes? Would the Titans start wearing sweater sets? Talk about your crossover crisis! Join us for this historical event, as two of the most awesome 2-D teams ever meet for the first time! Aw yeah, Archie Titans!